Back To Basics: Good For You, Good For The Earth Food writer Mark Bittman says eating like a vegan until dinner can protect your health and help save the planet. How we eat — and certainly what we eat — has a real impact on our bodies and the Earth. Try sticking to plants during the day, then indulging yourself at night — but with restraint. 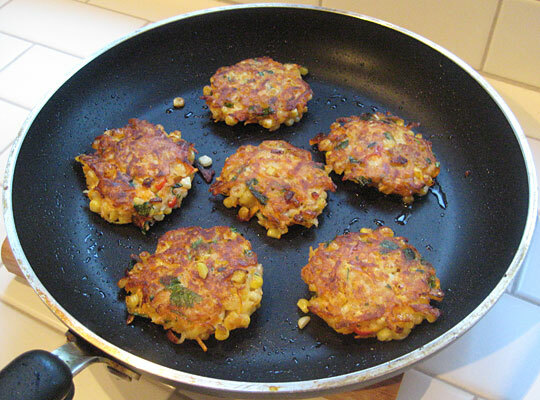 Get recipes for Cassoulet With Lots Of Vegetables, Eggplant And Chicken Parmesan, Vegetable Pancakes and Easy Whole Grain Flatbread (above). Mark Bittman is the author of How to Cook Everything and Food Matters, a look at the way we eat. He has been writing "The Minimalist" column for The New York Times for 11 years, his work in print has appeared in countless newspapers and magazines, and he is a PBS series host and a regular on the Today show. Learn more at www.markbittman.com. If you eat like a vegan until dinnertime, you can protect your health and help save the planet; how we eat — and certainly what we eat — has a real impact on both our bodies and the Earth. That's something to think about on Earth Day. As a cook and food writer, I've spent the better part of my adult life thinking about food. But it was only when my doctor told me I had to lose weight and lower my cholesterol and blood sugar levels — or face dire health consequences — that I began to seriously confront my own diet. And it was around this same time that a friend sent me a U.N. study showing that 18 percent of greenhouse gases come from industrialized livestock production. So I changed my diet, then wrote a book about it. I've increased the amount of plants that I eat and reduced the amount of animal products and processed foods. During the day, I eat only plants — vegetables and fruits mostly, but beans and whole grains, too. At night, I revert to a more indulgent pattern and let myself eat the food I love most (like the recipes below) — but with a little restraint. It's that simple, and it's been dubbed VB6 — Vegan Before 6. It's just one model of a new way of eating, but it makes sense on many levels. For one, by eating more plants, fewer animals and less processed food, I've lost 30 pounds and my cholesterol and blood sugar levels are normal again. Reducing your intake of animal products and processed food will do that. I'm also able to enjoy a bit of self-satisfaction knowing that, by an infinitesimal amount, I'm reducing the pace of global warming. And, in the midst of the current economic environment, I'm saving money by buying more "real" food and less meat and packaged junk. There is no doubt that food production is contributing to global warming and the environmental crises we're facing. Additionally, our national health crises can be attributed to diet. Think about how our ancient ancestors ate — the nuts-and-berries thing. Back then, it was a struggle to get enough calories to survive. Meat was a feast food, sugar was a luxury and fat was a treasure. However, as we learned to convert plant energy into high-calorie foods, we found ourselves on the other end of the spectrum: Instead of struggling to get enough calories, now we're struggling under the weight of too many. Consider this: The U.S. produces 10 billion animals a year just for food, animals that contribute one-fifth of all greenhouse gases and clog our arteries. Plus, we pay more for the food that's bad for us than we do for the vegetables, fruits and grains that are good for us. Now, I may not be the crunchiest guy around, but it's clear to me that the key to helping reduce global warming and avoiding the lifestyle diseases that plague many of us (myself included) is the same key to saving money on food: Go to the source. Eat more plants, fewer animals and less processed food. Think about changing your diet from the currently typical American one to the one I hope will become "typical" in the not-too-distant future. I bet you'll find that, like me, you'll get healthier. You'll lose weight, and you'll probably spend less money for more (and better) food. Plus, you can walk around with a smug smile on your face knowing you're doing something good for the Earth. Cassoulet is one of the best of the myriad of traditional European dishes that combine beans and meat to produce wonderfully rich, robust stews. This recipe maintains that spirit but is much faster, easier, less expensive and more contemporary, emphasizing the beans and vegetables over the meat. (That probably makes it more, not less, traditional, since meat was always hard to come by before the mid-20th century.) The main recipe starts with already cooked beans or canned beans and is ready relatively fast. To begin with dried beans, see the variation; it takes more time, but the results are even better. Heat the olive oil in a large saucepan over medium-high heat, add the meat and cook, turning as needed, until the meat is deeply browned on all sides, about 10 minutes. Remove from the pan and drain off all but 2 tablespoons of the fat. 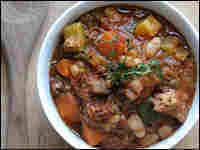 Turn the heat to medium and add the garlic, leeks or onions, carrots, celery and zucchini or cabbage. Sprinkle with salt and pepper and cook until softened, about 5 minutes. Add the tomatoes, their liquid, the reserved meat and the herbs and bring to a boil. Add the beans; bring to a boil again, stirring occasionally, then reduce the heat so the mixture bubbles gently but continuously. 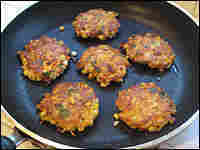 Cook for about 20 minutes, adding the liquid when the mixture gets thick and the vegetables are melting away. Fish out the meat and remove the bones and skin as needed. Chop meat into chunks and return to the pot along with the cayenne. Cook another minute or two to warm through, then taste and adjust seasoning if necessary and serve. 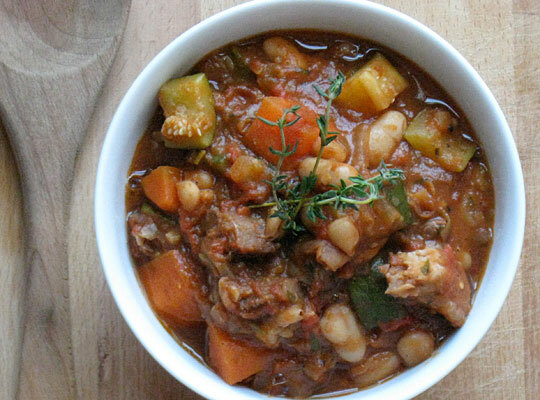 Slow-Cooked Cassoulet: Start with dried beans. After browning the meat, leave it in the pan and add 1/2 pound dry white beans that have been soaked. (Put the beans in a large pot with a tightly fitting lid and cover with cold water by a couple of inches. Bring the pot to a boil and let boil, uncovered, about 2 minutes. Cover the pot and turn the heat off. Let the beans soak at least 1 hour or up to 2 hours.) Add enough water or stock to just cover. Bring to a boil, then reduce the heat and cook, stirring occasionally, for about an hour. Meanwhile, in a separate pan with another 2 tablespoons of olive oil, cook the vegetables as directed. Add them to the pot of beans along with the tomatoes and herbs. Bring to a boil, then reduce the heat to a gentle bubble and cook, stirring occasionally, until the beans are tender, adding more liquid as necessary to keep them moist. This will take anywhere from another 30 to 60 minutes, depending on the age of your dried beans. Eggplant parmesan is a lot of work. Here's a more straightforward version, with the vegetables and meat grilled or broiled instead of breaded and fried. You can skip the chicken if you like, and add other vegetables, such as zucchini and portobello mushrooms; just grill them and layer on top of the eggplant and before the cheese. 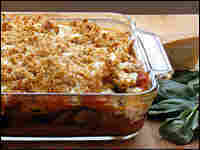 For a simple vegetable gratin, omit the tomato sauce and layer any cooked vegetable you like (asparagus, broccoli, cauliflower, artichoke hearts, potatoes, fennel, leeks, spinach, onions, celery root, parsnips, Jerusalem artichokes, winter squash, or sweet potatoes) with the cheese (Gruyere and Swiss are nice alternatives). Finish with the seasoned bread crumb topping for a most excellent crust. If the eggplant is particularly large or full of seeds, sprinkle it with salt and set in a colander for at least 15 and up to 60 minutes. Rinse and pat dry. Brush the eggplant lightly on both sides with some oil and sprinkle with salt (if you didn't salt it earlier) and pepper. Grill or broil until browned on both sides, turning once or twice and brushing with more oil if the eggplant looks dry. The idea is to keep the eggplant cooking steadily without burning, so adjust the heat and position as needed. The eggplant is usually ready in somewhere between 5 and 10 minutes. When done, set eggplant slices aside. Cut the chicken so you have 8 or so large pieces. Pound or press them a bit so they're evenly flat. Brush them all over with some oil and sprinkle with salt and pepper. Grill or broil the chicken, turning once, no more than 3 minutes per side (to check for doneness, cut into a piece with a thin-bladed knife; the center should still be slightly pink). Set the chicken aside. 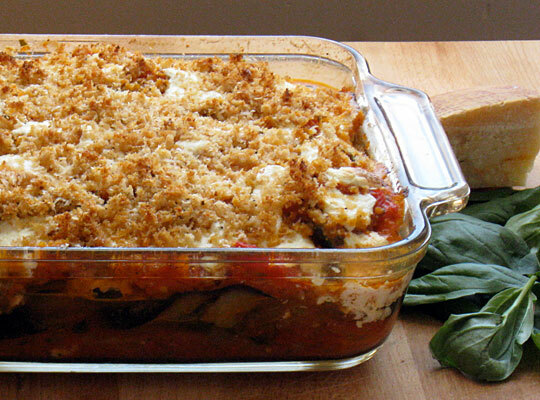 Toss the remaining Parmesan with the bread crumbs, and the mozzarella if you're using it. Drizzle with 1 tablespoon of olive oil, sprinkle with salt and pepper, then toss again. Spread the bread-crumb mixture evenly on top of the mozzarella. Bake for 30 to 35 minutes, or until the dish is bubbling hot. Serve hot or warm. Put the olive oil in a pot over medium heat. When the oil is hot, add the onions, sprinkle with salt and pepper and cook, stirring occasionally, until soft, about 3 minutes. Then add the tomatoes. Cook, stirring occasionally, until the tomatoes break down and the mixture comes together and thickens a bit, 10 to 15 minutes. For a thinner sauce, add some or all of the reserved liquid and cook for another 5 to 10 minutes; if you want a thick sauce, save it for another use. A surefire way to get anyone to eat any vegetable, these crisp babies are delicious as a side dish, as an appetizer or served on a bed of greens as lunch. Root vegetables are most common, but you can use whatever looks good to you, alone or in combination: zucchini, yellow squash, winter squash, corn or chopped scallions; even spinach or chard is good (just cook it, squeeze it dry and chop it first). And consider tossing in a tablespoon of fresh herbs or spices. Sweet potato and corn benefit from a bit of cilantro; zucchini comes to life with dill; and ginger or cardamom will warm up winter squash beautifully. Grate the vegetables by hand or with the grating disk of a food processor. Mix together the vegetables, onion, egg and 1/4 cup of the flour. Sprinkle with salt and pepper. Add a little more flour if the mixture isn't holding together. Put a little butter or oil in a large skillet or griddle over medium-high heat. When the butter is melted or the oil is hot, drop in spoonfuls of the batter, using a fork to spread the vegetables into an even layer, pressing down a bit. Work in batches to prevent overcrowding. (Transfer finished pancakes to the oven until all are finished.) Cook, turning once, until nicely browned on both sides, about 5 minutes. Serve hot or at room temperature. The simplest bread is nothing more than water and flour. Heat some olive oil in a pan — you can add other flavorings, too — and this basic formula becomes a quick flatbread that's ready in the time it takes to cook dinner. 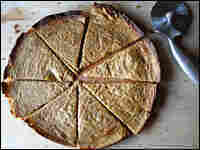 The idea comes from the recipe for socca (also called farinata), the Mediterranean "pizza" made from chickpea flour (see the variation below). 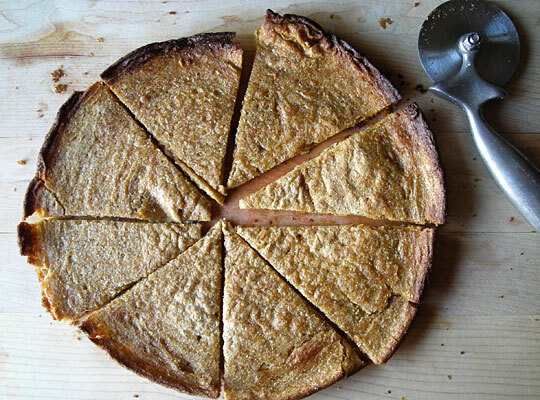 Chickpea flour and buckwheat flour are certainly options for the main recipe, too, but whole wheat flour and cornmeal are far more common and equally delicious. A couple of technical details. The resting time for the batter is optional, but it results in a more complex flavor and a creamier, less gritty texture. If you're in a hurry, though, just let the batter sit while the oven heats. It's still awesome. And though a round pizza pan with a lip is ideal, a 10- or 12-inch skillet also works well; the bread in the smaller pan will need less oil, will be slightly thicker and will take another 5 or 10 minutes to bake. You can bake the bread up to several hours in advance; warm it a little if you like — or not. Put the flour into a bowl; add salt, then slowly add 1 1/2 cups water, whisking to eliminate lumps. Cover with a towel and let sit while oven heats, or for as long as 12 hours. The batter should be about the consistency of thin pancake batter. When ready to bake, heat the oven to 450 degrees. Put the oil in a 12-inch rimmed pizza pan or skillet (along with the onion and rosemary if you're using them) and put in the heated oven. Wait a couple of minutes for the oil to get hot, but not smoking; the oil is ready when you just start to smell it. Carefully remove the pan (give the onions a stir); then pour in the batter, and return the skillet to the oven. 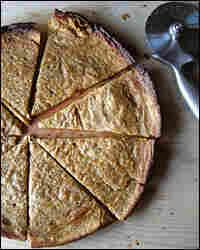 Bake 30 to 40 minutes, or until the flatbread is well browned, firm and crisp around the edges. (It will release easily from the pan when it's done.) Let it rest for a couple of minutes before cutting it into wedges or squares. When the bread is done, top as you would pizza, using a relatively light hand. Smear a thin layer of tomato sauce on first, if you like, then add a sprinkling or crumble of cheese and thinly sliced vegetables, cooked meat, olives, onions — whatever. Turn on the broiler and put the pan under the heat until the ingredients are hot and bubbly. Let rest as above, then cut and serve. It's crisp on the bottom and custardy on top. Chickpea flour is authentic, but whole wheat flour produces lovely results. You'll need a deep 12-inch pan or skillet. Increase the water to 3 cups and add up to another 2 tablespoons of oil if you like. Bake as above, but longer — closer to an hour. To get a crisper top, set under the broiler for a couple of minutes after the bottom is nicely browned. Let cool a bit in the pan, then slide a narrow spatula under the bottom to remove it. Cut into wedges and serve.